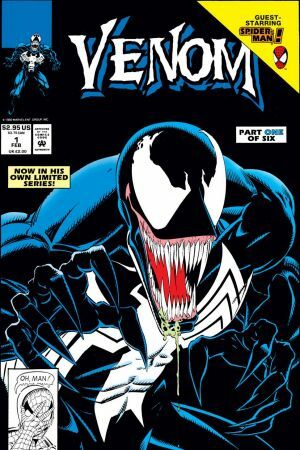 The first and most infamous man to call himself Venom, Eddie Brock was bound to an alien symbiote following its rejection by Peter Parker. Driven by all-consuming hatred, Venom’s sole desire was to kill Spider-Man. Of late, Brock has aligned himself with heroes, seeking to atone for the blind, violent rage of his parasite. Disgraced as a journalist when Spider-Man reveals the truth about his biggest story, Eddie Brock becomes bonded with the Venom symbiote…and lures Spidey into a trap! Venom challenges Spider-Man to a duel in his subterranean lair, giving him 24 hours to prepare. 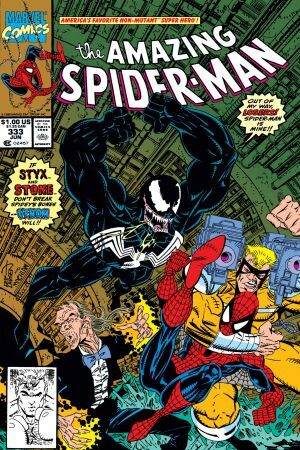 But with the arrival of super-villain duo Styx and Stone, the symbiote lashes out on its own! Brock and his symbiote are no longer one. Incarcerated on Ryker’s Island, Eddie is menaced by fellow inmate Cletus Kasady. But just as Kasady whips out a shiv on Brock, the Venom symbiote returns and saves its host. 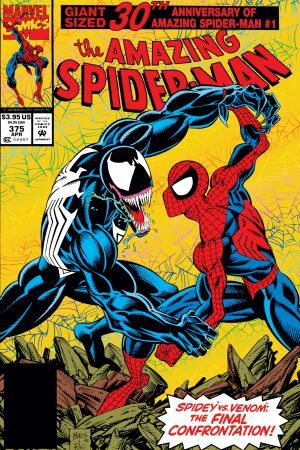 After Venom kidnaps Peter’s parents (later revealed to be Life Model Decoys), Spidey tracks down the villain to an abandoned amusement park with the help of Brock’s ex-wife. A three-way battle ensues between Venom, Spider-Man, and Silver Sable’s Wild Pack! Craving a hero’s fulfillment, Brock enters murky moral territory when he ‘takes up the cape’ in San Francisco. 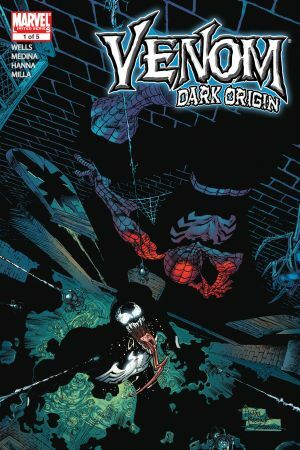 Eddie’s intentions are clear, but will the Venom symbiote allow its host to be anything more than lethal? 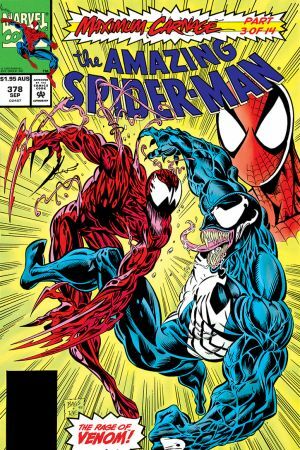 Carnage, the first spawn of the Venom symbiote, has banded with other super-villains to terrorize New York. 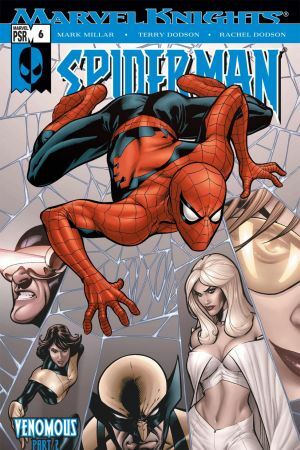 Feeling responsible for the massacres of his “son”, Venom returns and temporarily teams with Spider-Man! 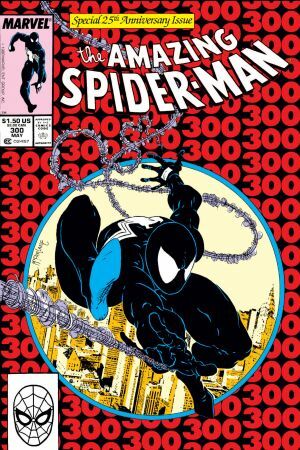 Feeling philanthropic, Brock decides to sell his symbiote for $100 million and donate the money, despite the fact that his symbiote is the only thing keeping his cancer at bay. Who will be the next Venom? 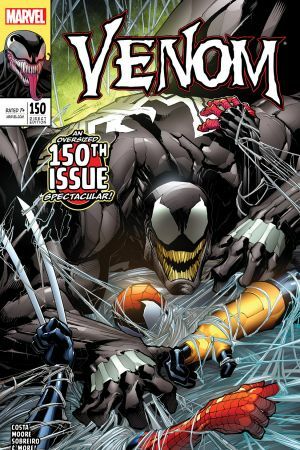 After being cured of cancer at the mysterious hands of Mister Negative, Brock is attacked by Mac Gargan – then-current host of the Venom symbiote! On the unlikely day when an embittered journalist met a spurned symbiotic organism from an alien planet, one of Spider-Man's greatest enemies was born – read the true, twisted roots of Eddie Brock! 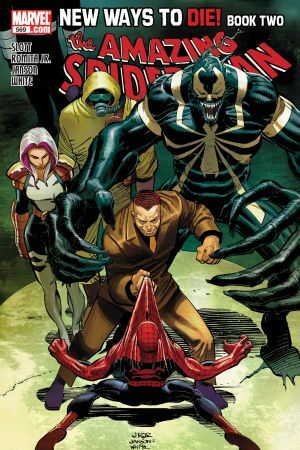 While continuing his crusade to destroy all symbiotes left on Earth, Brock tracks down Flash Thompson, a.k.a. 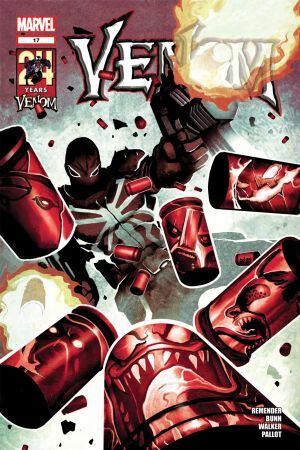 Agent Venom, and attacks him with sonic bullets! 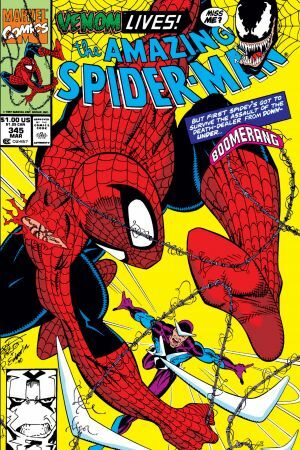 Then, it’s more symbiotes than you can shake, when Brock’s captured by the Crime-Master and forced to bond with Toxin! Eddie Brock and the Venom symbiote have been reunited, and they’re web-slinging their way around New York again. Featuring a host (hah!) of Venom creators from the character’s near 30-year history, this monstrous anniversary spectacular welcomes guest artist Tradd Moore for an oversized and brutal main story AND a lethal story featuring fan-favorite creators David Michelinie and Ron Lim!